LOS ALAMOS, N.M., June 19, 2018–A new study by Los Alamos National Laboratory scientists and colleagues confirms that increasing minimum winter temperatures allow beetles to expand their range but reveals that overcrowding can put the brakes on population growth. "It has long been predicted that warming winters will allow range expansion. This is the first large dataset that demonstrates that warmer winter temperatures are likely allowing mountain pine beetles to establish outside of their native range," said Devin Goodsman, a Los Alamos postdoctoral researcher and first author on the report. "Both competition and winter cold are known to be important causes of mortality, but no previous studies addressed how these mortality factors interact." Although the insect is diminutive, the bark beetle's impact is colossal. Massive outbreaks in recent decades have consumed large swaths of Western forests, where 100,000 trees may fall every day. Some regions have lost 90 percent of the conifers. The outbreaks, mounting in size and severity, are now infesting new tree species and expanding beyond the Continental Divide across North America and into boreal forests. Normally kept in check by long, cold winters, beetle populations are exploding thanks to warming temperatures and longer reproductive seasons. Thousands of these beetles attack an individual tree, and drought and hotter temperatures significantly weaken trees, preventing them from creating adequate protective resin. The beetles release a chemical that alerts others that they've found a fragile tree, and they swarm, feeding and breeding below the bark, impairing the tree's food transport and secreting fungus that feeds larvae and kills the tree. And now, the beetles are attacking healthy trees. The study, published in Global Change Biology, is the first of its scope, encompassing a nine-year dataset sampling 10,000 trees across 22 million acres. 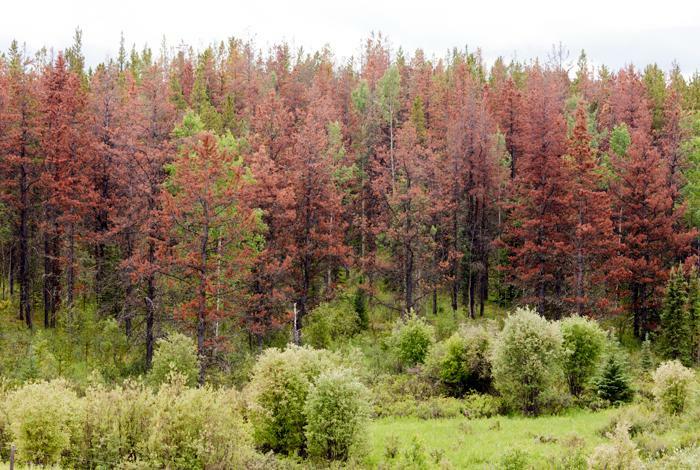 The study focused on Alberta, recently invaded by beetles from British Columbia, where they have lost the majority of the pine trees. The study was the first to inspect how rising beetle populations can limit the damage, because many hungry larvae compete for nutrients and carbohydrates stored below the bark in the phloem. While the cold temperatures that normally kill the beetles are diminished, analysis revealed that resource competition can be a stronger factor than even the cold on beetle mortality. Even in favorable climates, overcrowding can inhibit outbreaks, sometimes before all susceptible trees have been infected.